For the adventurous person, the only way to explore the Island of Mallorca without being tied to public transport is to hire a car. For more information on things to see and do in Mallorca, see the car hire in Mallorca page. It is recommended that you pre-book your hire car before arriving at Palma airport. This will avoid unnecessary waiting and filling out paper work, you will also be able to book the type of car you would prefer. You can often benefit from better deals and discounts by booking in advance. There are two blocks of car hire desks along the wall facing the main exit doors of the terminal. You will find Hertz Car Hire in this section of the airport located on the ground floor in the public arrivals area of the main airport terminal. To collect your hire car you need to present your driving license, passport and booking documentation to the Hertz desk. Where can I book my hire car at Mallorca Airport? You can book a hire car at Palma de Mallorca Airport easily with Gesman Rent a Car on the Car Hire Reservation page. Palma de Mallorca Airport (also know as Son Sant Joan Airport) is located only 8 kilometers east of the city of Palma and is one of the busiest Airports in Spain, especially in the summer months where it briefly takes the top spot for air travel volume in the whole country. We know that you want your visit to Mallorca to be an enjoyable one so we have provided some information to help make your travel to and through Palma Airport easier. You'll also find that car hire at Palma airport is cheap and simple to book online. Palma de Mallorca airport takes over 20 million passengers to their various destinations including Spain, Germany and the United Kingdom. Within Europe, Mallorca airport is situated among the top twenty airports. The facilities are made up of various buildings that are integrated into the main terminal. It is split into six floors allowing ample opportunity for airport shopping and relaxation. There are four boarding modules A, B, C and D.
Mallorca airport offers a wide variety of shops that you'll find in the public and passenger only areas of the main terminal and the four boarding modules. You can enjoy duty free shopping in these zones as well as a choice of places to get something to eat and drink. There is a pharmacy in the airport departures public zone on floor 4. It is open every day between 07:00 and 21:00. The shops at Palma airport include a tabacconists, toy shop, leather goods shop, shoe shops, a jewellers, opticians, florists, gift shops and a clothing accessories shop with a large Multi Store in Module B. In the main terminal and modules A, C & D Aldeasa duty free shops are selling wines, liquors, perfumes, cigarettes, tobacco, toiletries and more. If the bustle of Palma airport is too much for you then a VIP airport lounge is the option for you. You'll be able to watch television or make use of the various business facilities including internet, fax and email that are available in the VIP lounges at Palma airport. Getting There: After check-in make your way to departures on the 4th Floor. The Lounge is located after Security Checks on the right (Module D). Getting There: After going through security take the escalators to the floor below. The Miro VIP Lounge is located in the boarding area in front of Terminal B.
Mallorca airport has see continous growth in particularly since the 1980s. Passenger volume increased to more than seven million in 1980 to nearly ten million in 1986 and exceeding 15 million in 1995. With growth like this, a new terminal needed to be constructed to form the current Son Sant Joan Airport in Mallorca. Work on the airport began in 1993, with a budget of more than 40 billion pesetas in the following three years. 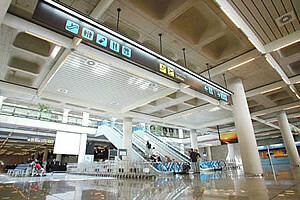 The new terminal was designed by Majorcan architect Pere Nicolau Bonet and was opened in 1997. Looking to the future, Palma de Mallorca airport plans to increase its passenger capacity to 38 million passengers for 2015.